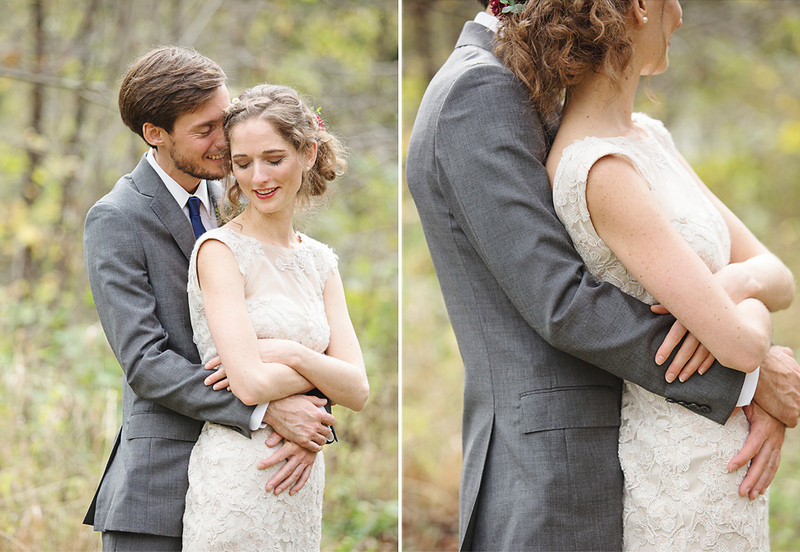 LOUIS + ELLIE :: MARRIED! 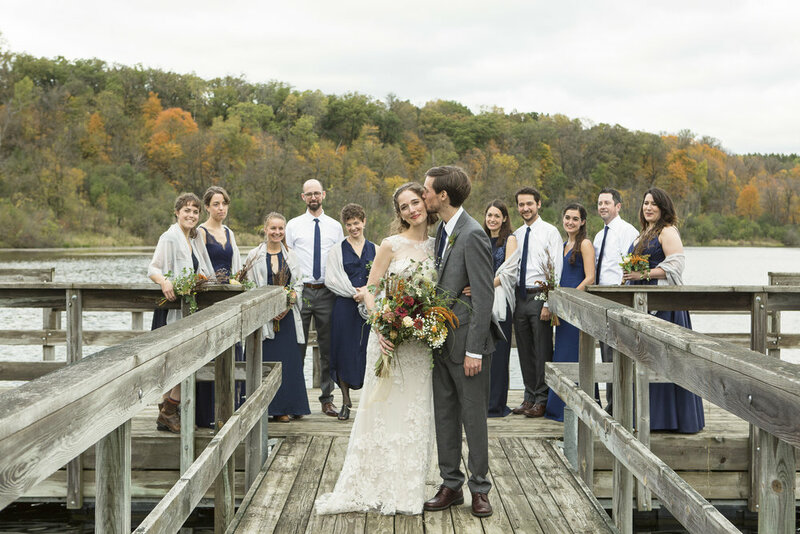 This one is for the reverent, the poets, the romantics, the dreamers . . . .
Louis and Ellie stole away from their lives in Ithaca, New York to celebrate their love near Ellie's childhood stomping grounds in William O'Brien State Park, just outside of Stillwater, Minnesota. 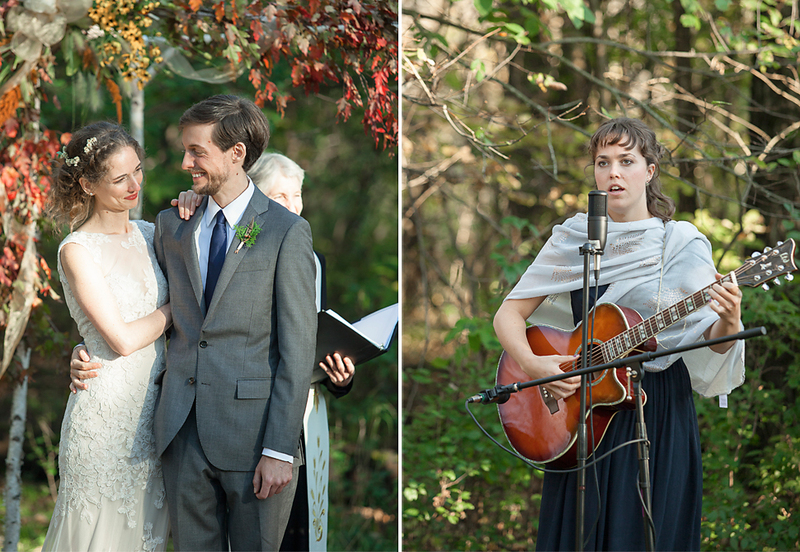 Louis and Ellie wanted a simple, intimate October wedding set in the color-filled fall trees. 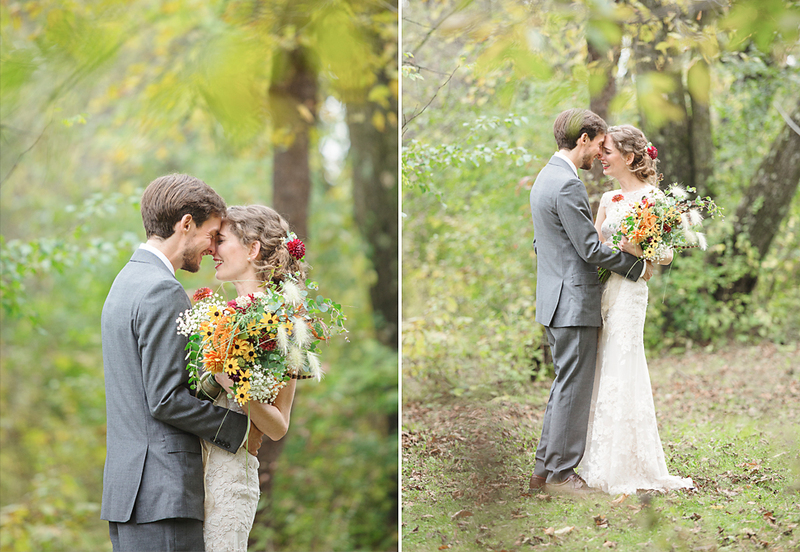 As it turned out, they couldn't have had a more perfect day! 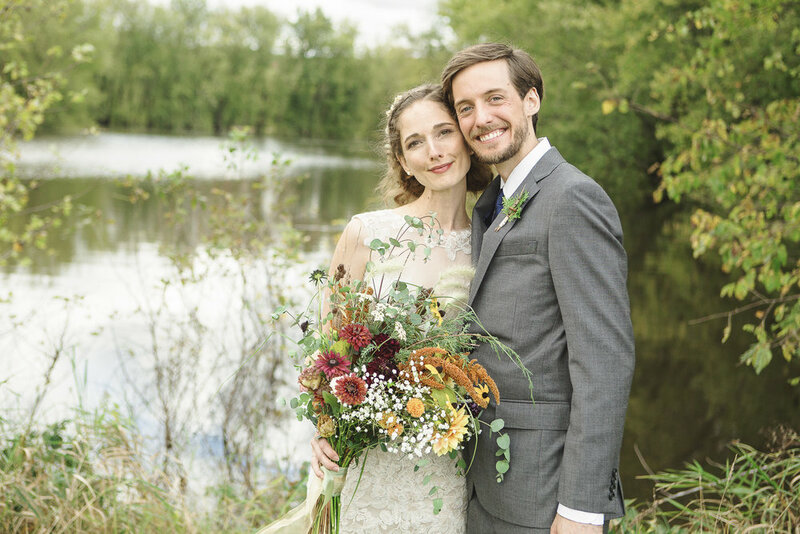 When I asked Louis and Ellie what they looked forward to most about their wedding they said, "we're more ceremony people than reception people, and I think we'll be glad to be overwhelmed by such a beautiful undertaking." 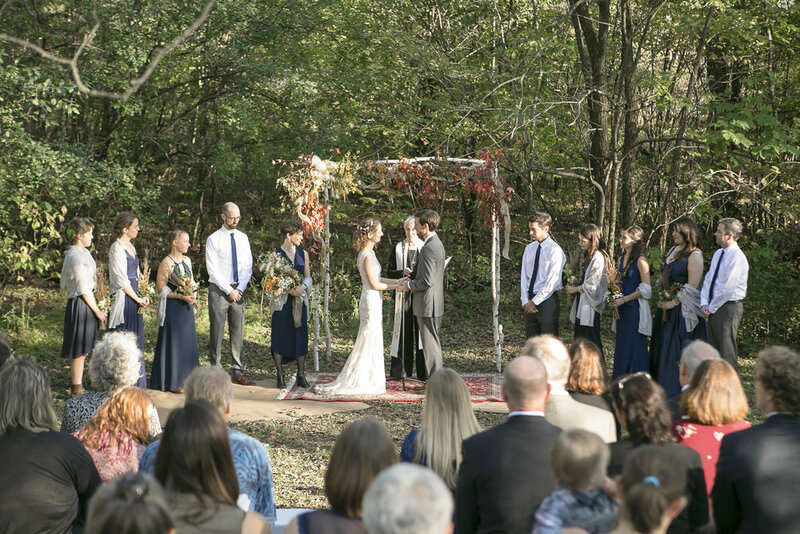 Ellie continued, "... we really believe in speaking vows in beloved community as covenant: what we're promising to do for the rest of our lives." Flowers girls threw collected piles of leaf "petals" down the aisles leading the way to the natural birch arbor under which Louis and Ellie would commit their love. 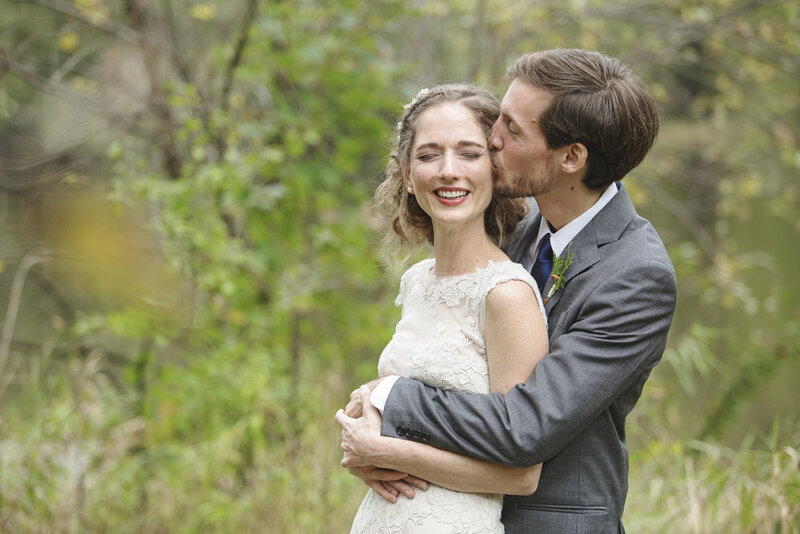 Surrounded by only the closest of friends and family they shared the emotional, poetry-filled vows they'd written for each other. Meanwhile, the ground suddenly felt reverent. On a personal note, this wedding was bittersweet. Ellie and Louis found me when I was still under the business name "Leaves of Grass." There have been few and far between who recognize my name as a work of Walt Whitman. But being poets, Ellie and Louis immediately knew we were a match. 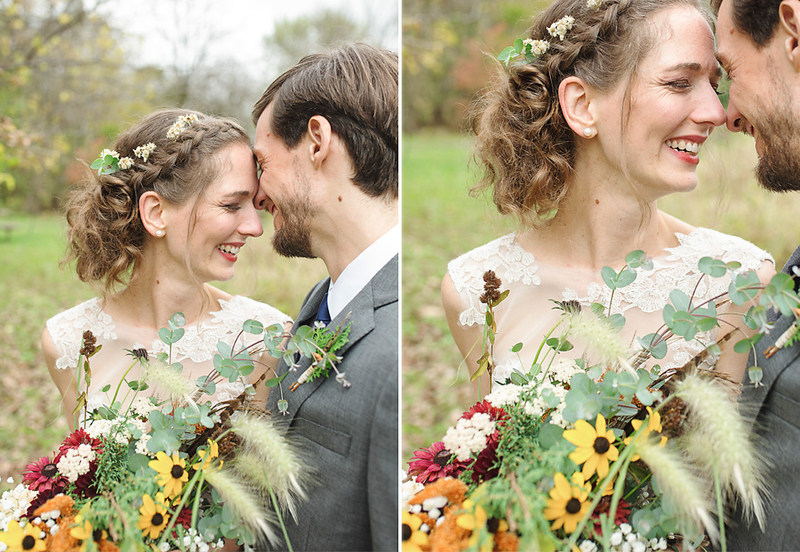 I couldn't have had a better couple to end that season with as, ironically, they were the last wedding I would photograph as Leaves of Grass Photography. 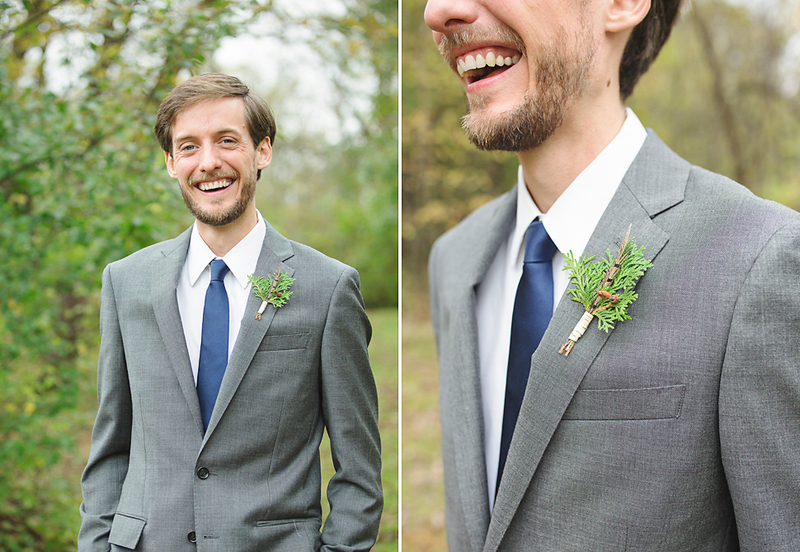 Before the ceremony, a blessing, a stolen glance and official "paperwork" surrounded by cheers and exclamations of "we're married?!?!" 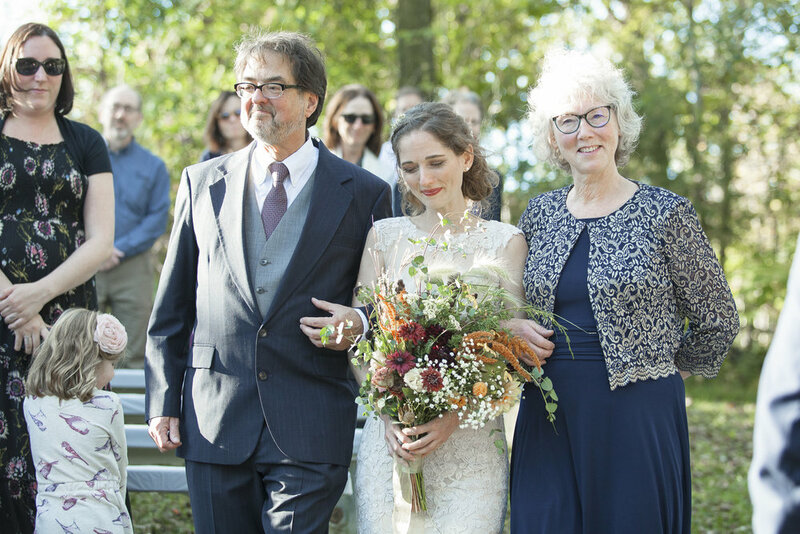 The sun came out for the ceremony creating an angelic-like glow on Ellie. 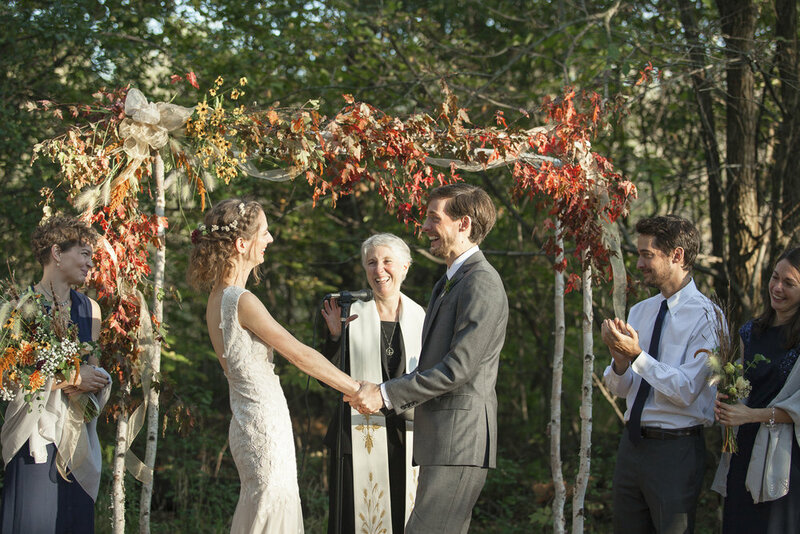 Surrounded by only the closest of friends and family they shared the emotional, poetry-filled vows they'd written for each other. Meanwhile, the ground suddenly felt reverent. After the ceremony Ellie and Louis grabbed their backpacks and water bottles and ran away to the fields to catch the sunset. 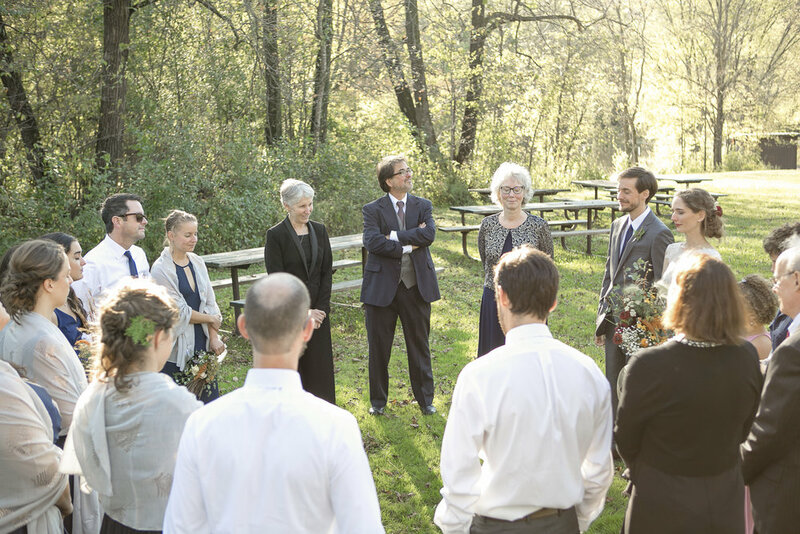 I was honored to join them for a few beautiful moments before they headed off to celebrate with guests at the nearby town hall. Ellie is a creative writer. Enjoy their love story, in her words. If you're like me, you've already fallen in love with these two. Enjoy. That day, Ellie offered to share her umbrella, her favorite mountain hikes, and half of a muffin. Louis accepted. And on Louis’s birthday, we ran around Lake Padden at dawn and dove in together. We were smitten. In October, Ellie wasn’t sure Louis had asked her on a date when he proposed that we set out together at the golden hour with five poems each to read aloud. 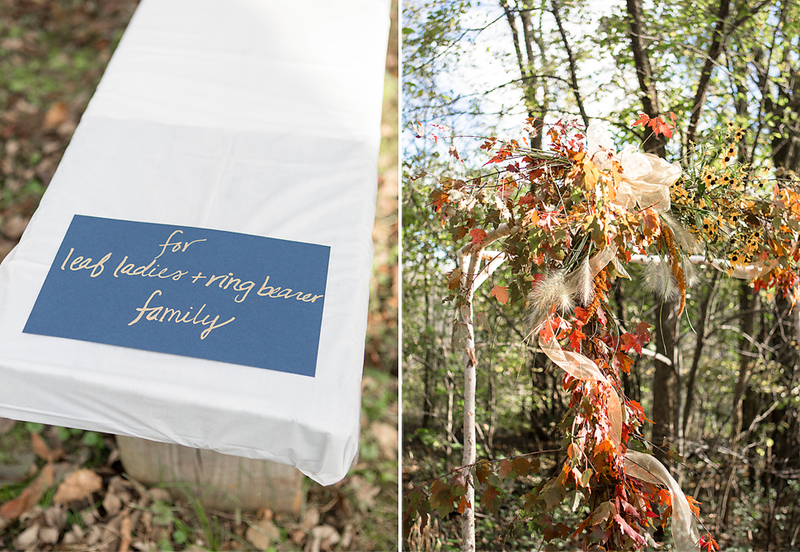 (And wine and a picnic blanket.) We perched on an outcrop of rocks overlooking the Salish Sea and read to each other. Louis hid his Robert Frost, just in case Ellie turned out to be a poetry snob. Ellie read one of her own poems, and Louis rejoiced that he actually liked her work. The evening turned out to be a (perfect) date. Many of our first dates were poem exchanges. We read poems about rain in the pouring autumn rain at the top of Sehome Hill. We read poems about winter with a thermos of hot cider. We read poems about bodies of water at the edge of the lake dock in spring (also in the rain). We read poems about celestial bodies under a full moon. 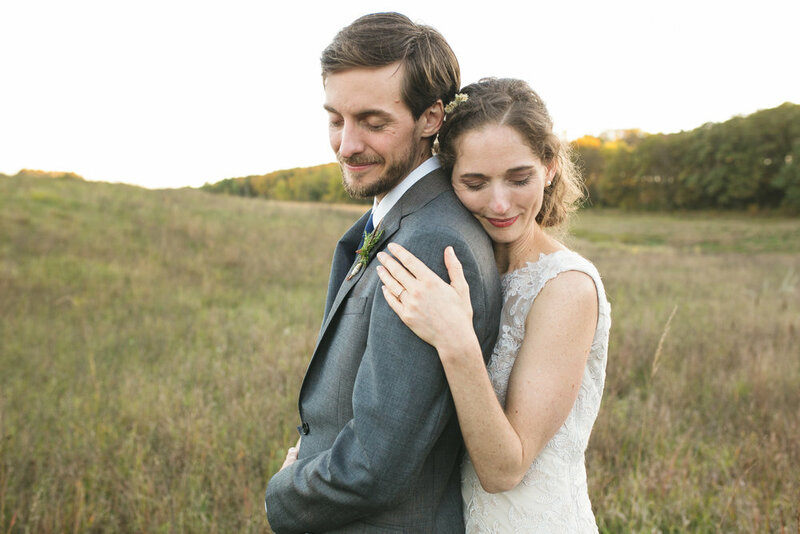 We collected a few love poems from our first dates to share with you since poems helped us choose each other. Sometimes we read poems to offer up our love before we could say “love” ourselves. You can follow the arc of our nerves in Brautigan to our Keatsian swoons to our bewilderingly full and lasting partnership. Now it is the morning of our mornings together. Thank you for celebrating love with us!" 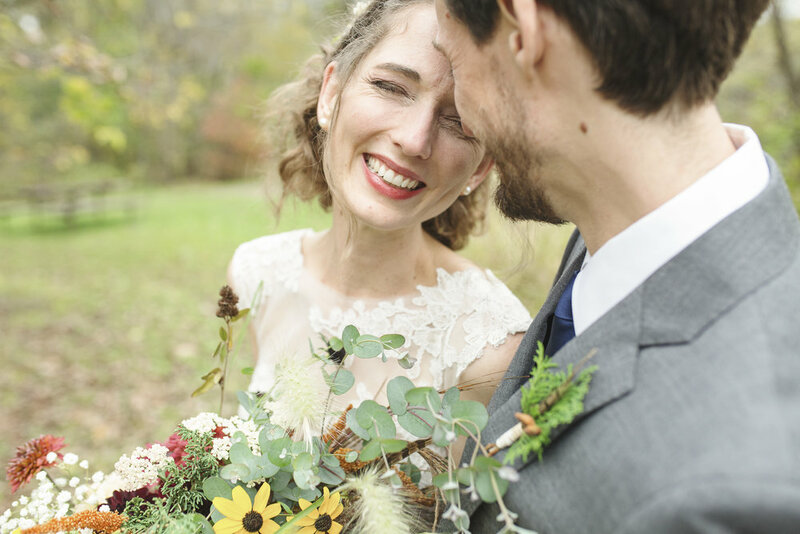 "The night before we left Bellingham to move east to Upstate New York, we returned to the place of our first date, and Louis proposed. We planned one final poetry exchange on that outcrop above the Puget Sound during the Golden Hour. Ellie knew the proposal was coming, but Louis surprised her with a little scavenger hunt back around Bellingham in the last light of the day. He presented her with a poem in parts, each leading to one place of deep memory and meaning. All along the way, we talked about what had been, and finishing at the cove of our first kiss, we promised what would be." 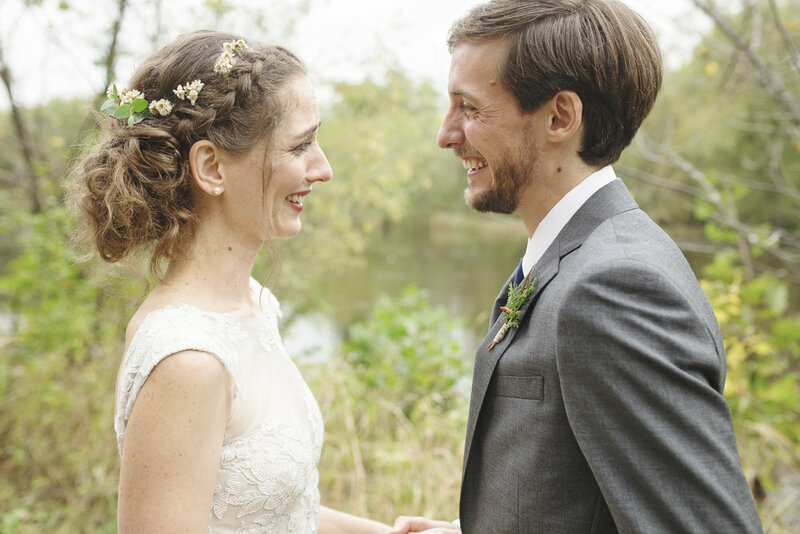 Ellie & Louis, it's an honor to have shared in your story. Thank you for blessing me. Before the New Year Begins . . .